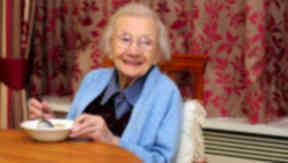 Jessie Gallan said the secret to a long life is porridge and 'staying away from men'. Scotland’s oldest woman, who credited her 109 years on "staying away from men", has died. Jessie Gallan, who lived at Crosby House care home in Aberdeen, died three months after her birthday in January. Asked what the secret of long life is, Ms Gallan said it was down to a bowl of porridge every day and staying away from men. She said: "My secret to a long life has been staying away from men. They’re just more trouble than they’re worth. "And I like my porridge. I have all my life." Born in 1906 in a tiny two-room cottage on a farm in Kintore, Jessie had a simple upbringing with five sisters and one brother, sleeping top-to-tail every night on a straw-filled mattress. When she grew up, Ms Gallan left school to work in a farm kitchen, before moving to the city. She started a housemaid's job at the home of a wealthy businessman in Aberdeen's Gray Street. A country girl at heart, she soon moved back to Aberdeenshire to work in the service sector. She started work as a waitress at the Lauriston Hotel in Ballater, where she said the visit of Queen Elizabeth and the Queen Mother each year was the highlight of the season. Ms Gallan remained there for ten years, but determined to make a better living for herself, she moved back to the city to work in the dining rooms of Aberdeen's finest townhouses. On her birthday, staff at Crosby House said Mr Gallan was an independent lady. Gillian Bennett, a senior support worker at the home said: "Jessie is a lovely woman. She has got her best friend here, Sarah Jane, and they are always together. "She likes her music and likes her exercise class and is a very independent person. She is always walking about." Ms Gallan became Scotland's oldest woman after 109-year-old Glaswegian Clare Dawson died in 2013.